The recent rainy days forced organizers of the University of San Diego's Spring Alcala Bazaar on Tuesday to switch from the outdoor Paseo de Colachis area to inside the Hahn University Center Forums and adjacent covered spaces outside. 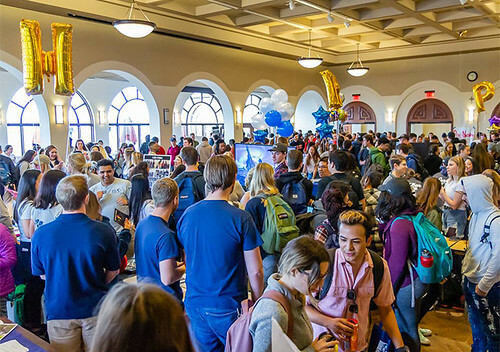 Rain is inconvenient for planning purposes, but it can't stop USD from making sure students know the resources, activities, clubs, organizations, causes, opportunities and changemaking possibilities available. Twice in an academic year, at the start of the fall and spring semester, the Alcala Bazaar is the must-attend event. Most of the 200-plus tables utilized Tuesday afternoon were inside the forums with placement determined alphabetically, but there plenty of tables outside the venue that one could spend quality investigating time there before ever going inside. The Writing Center, located in Founders Hall, serves students who need assistance with class papers. The student consultants will not write your paper, but they can walk you through ways to write a better paper. Their office is in Founders Hall 190-B and opens Feb. 13 at 9 a.m. for writing appointments. The Womxn of Color Circle is in its first year of operation, but its presence at the fall and spring Alcala Bazaar, and December's Womxn Summit, attended by a cross-section of the campus community, has some momentum. Placing their table next to the Women's Commons delivered a one-stop presence to inform and better connect with female students on campus. Walking closer to the UC entrance, several tables were underneath a big tent. Inside and eager to greet passers-by was the SMILE Club. While easy to imply its main function, the Smile Club is a wonderful support system that any college student, at USD or not, should appreciate. SMILE, or Students Making Initiatives to Love Everyone, show their care for fellow Toreros with final exams care packages, provide supplies so students can do handwritten thank-you notes for a favorite professor, participate in USD-connected spirit events at Homecoming and more. At the next table was a Students of Color in STEM/M (Science, Technology, Engineering, Mathematics) group. Led by a pair of graduating seniors, they created an organization and their main task now is talking to younger students who share their aspirations and who can keep the group going forward. Momentum and transitional leadership are critically important for any club or organizations on campus. The Alcala Bazaar is also an event where you want to make your debut. The interest group, Students Supporting Israel, is new on campus and is planning meetings and events. Flanked by an Israel flag on one side and a U.S. flag on the other, explained their desire for the group and to help facilitate hearty discussions amongst the campus community. The Student International Business Council (SIBC), the only privately endowed student-run council on campus, shared its mission of offering undergraduates real-world business experience and foster peace through commerce. Students can work on international and domestic business projects and network with fellow SIBCs at the University of Notre Dame and Benedictine College and IBC alumni. Meetings are Thursdays at 12:15 p.m. in Olin Hall 125 and all majors are welcome. USD Rotaract, supported by the Del Mar, Coronado and La Jolla Golden Triangle Rotary Clubs, is a student group dedicated to working on community and university service projects. It is connected to the Institute of College Initiatives, which also oversees such vital campus entities as Student Support Services, Upward Bound and McNair Scholars. One upcoming event is the eighth annual Rotary District 5340/Kroc School of Peace Studies’ Peace Forum on Feb. 23, from 8 a.m. to noon. This year’s forum theme is Human Trafficking. It is free, but registration is required. Another strong community group was Saturdays with Seniors. It’s an opportunity for students to volunteer their time with local senior citizens in nursing homes. Dedicating a few hours each Saturday, students can participate in making crafts, playing board games, singing karaoke, attending an ice cream social and more. Once inside the UC forums, there were crowds of people for everything from foreign language and cultural clubs, Greek Life fraternities and sororities, USD Athletics, Bull Pit, Center for Peace and Commerce advertising its February Idea Labs and early Global Social Innovation Challenge deadlines this month, campus recreation, club sports, Student media (USD Vista, USD Radio, USDtv) as well as representatives from the various USD schools. One creative club was the 3D Printing Club through the Shiley-Marcos School of Engineering. Co-President and senior mechanical engineering student Christian Yee-Yanagishita spoke as his own 3D printer was busy creating a light blue King chess piece as a demonstration. The club is open to all USD engineering students and is a prime opportunity to gain 3D printing experience. Meetings are at 1 p.m. the last Thursday of each month inside the engineering school’s Donald’s Garage. For engineering students, it’s the chance to create a 3D print item. For entrepreneurs it’s attending Entrepreneurship Club meetings. Join USD’s Be Blue Go Green team because of your interest in sustainability and the environment. Make the dream of a young boy or girl suffering from a potentially life-threatening disease or medical condition dream come true as a member of the Make-a-Wish Club. Want to have a study abroad-like experience while on campus? You can by attending and socializing at the International Student Organization’s Coffee Hour on Thursdays or the 2019 International Expo and Cultural Fashion Show on March 22 in the UC Forums. The Alcala Bazaar is surely a prime place to find a pathway to involvement beyond just being a USD student. There’s literally no excuse not to be connected somewhere and somehow on campus. Photos in the slideshow were taken by Ryan T. Blystone and some are courtesy of the Torero Life Facebook page.